The therapists at ARC use physical therapy and other manual techniques to increase the blood flow to the injured area thereby starting the healing. Tennis elbow, or lateral epicondylitis, is the most common injury in patients seeking medical attention with the complaint of elbow pain. The muscle group involved, the wrist extensors, function to raise the hand up. Specifically, the extensor carpi radialis brevis has been implicated in causing the symptoms of tennis elbow. Patients with this tennis elbow syndrome experience pain on the outside of the elbow that is worsened by grasping objects and cocking back the wrist. The pain associated with tennis elbow usually has a gradual onset, but may also come on suddenly. 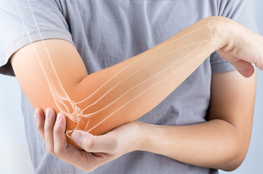 Anyone can be affected, but tennis elbow is most commonly seen in people that use their hands a lot, so therefore not only tennis players (hence the term), but also manual laborers, secretaries, or cashiers. This chronic overuse of the muscles that control the hands results in muscle guarding and muscle tightness, which will impede the blood flow, and therefore restricting the access to nutrition and oxygen necessary for healing. In turn, this will lead to a vicious circle of even more muscle guarding, tightness and pain, and eventually to chronic degeneration of the tendon causing small tears and ruptures. Anti-inflammatory medications - often used to help control pain and inflammation. Steroids (cortisone injections) - it is unlikely that additional injections will benefit the patient. Surgery to release the damaged tendon - may be needed in a small percentage of patients. A more conservative and less invasive treatment option is physical therapy.The Therapist at ARC use physical therapy, manual techniques, soft tissue massage and modalities like ultra sound, heat and medical acupuncture to loosen up the muscle tissue to increase the blood flow to the injured area. Hereby starting the healing process by providing access of nutrition and oxygen to the injured area.